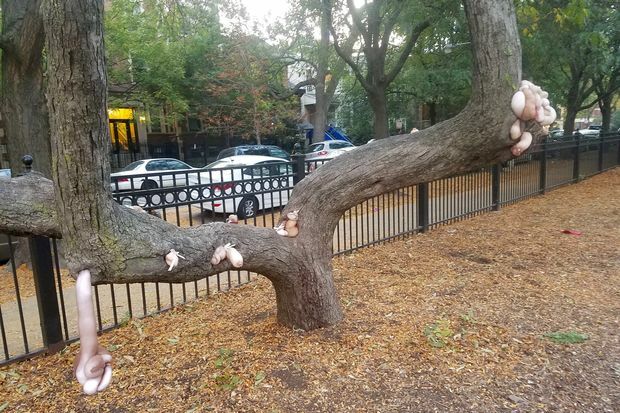 WICKER PARK — An old tree in Wicker Park has sprouted some very unusual parts. 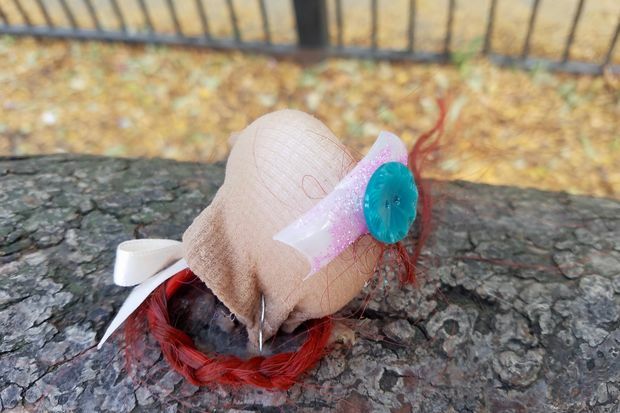 Located in Wicker Park's namesake park at 1425 N. Damen Ave., the tree was recently adorned with puffy handmade objects that appear to be made of stuffed nylon, ribbon, black and red threads and buttons. 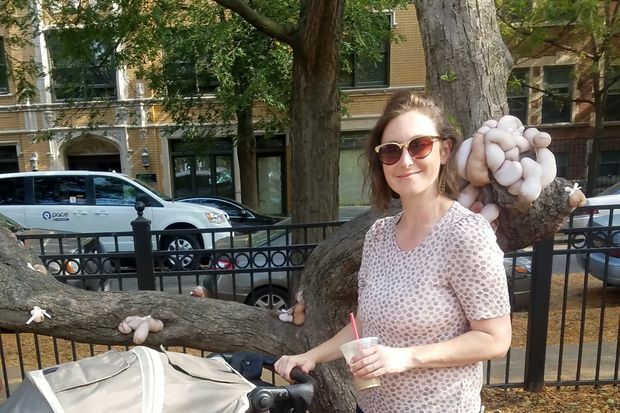 Leigh Shea, a Ukrainian Village resident who was headed to the park with her children Monday morning, said that she saw the art getting installed around 10 a.m. Wednesday or Thursday. "It was two women, maybe in their 20s or 30s. We passed them, they kind of looked at me and giggled and I giggled back and said, 'That's pretty cool,'" Shea said. 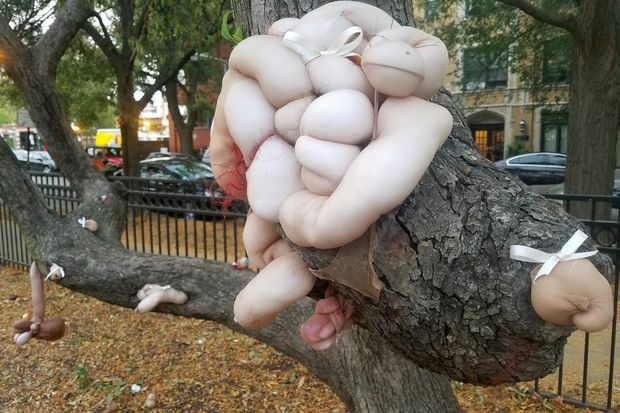 When asked what she thought the art represented, Shea said, "My initial thought was human entrails coming out of the tree. But there's ribbons too, tied to [the entrails]. I don't know." Ukrainian Village resident Leigh Shea said she saw the art being installed last week. 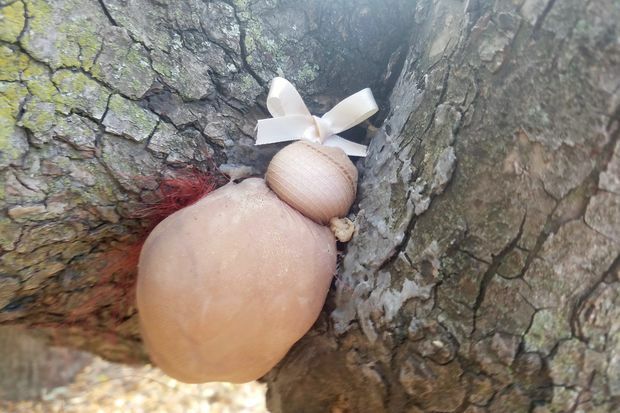 Tree art? What is this? The dangling art confused at least one local dog, who nevertheless continued to "mark" the tree.